Join Rev. Canon J. John as he guides us through The Lord's Prayer, breaking it down into 7 easy-to-follow phrases allowing us to understand more about why and how we can pray. This 16-page booklet is a great introduction to a God who listens, and is available with fantastic bulk-buy discounts. Why Pray? has been originally produced for CWR's National Prayer Weekend (25-27 September 2015) encouraging people to hand out to their localities in order for them to learn more about Jesus. 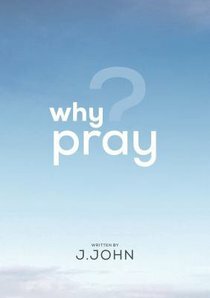 About "Why Pray? (Pack Of 10)"
J.John, a Greek-Cypriot by birth, lives in Chorleywood, Hertfordshire. He is married to Killy and they have 3 sons, Michael, Simeon and Benjamin. J.John became a Christian in 1975. J.John has been described as refreshing, humorous, passionate, earthy, accessible and dynamic. J.John is regarded as one of the most creative Christian speakers with an appeal that transcends gender, age, race, culture and occupation. His much-loved art of storytelling helps people to discover spiritual meaning in a way that makes sense of everyday life. To date, he has completed thousands of speaking engagements at conferences, towns, cities and universities in 54 countries on 6 continents. J.John has authored 21 titles, and there are over million copies of his books in print in thirteen languages including Dead Sure, Breaking News, The Christmas Compendium, 26 Steps to Heaven, Marriage Works and his latest title Soul Purpose.